If you’re looking to hire a capital campaign consultant, then you probably know that they can be a valuable asset to your campaign. However, finding the right professional for your nonprofit isn’t always easy. Picking the right consultant can be critical to your campaign’s success because they can help shape everything from your case for support to your marketing materials. Therefore, it’s important to know how to select a professional that can give you the most assistance. 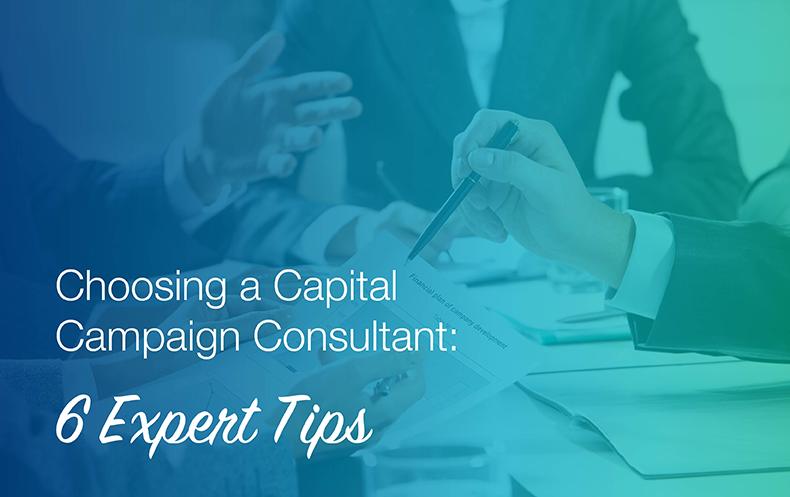 In case you’re not sure where to start, we’ve come up with a list of tips to help ease you into the process of choosing a capital campaign consultant. Think about your consultant’s location. Find someone with capital campaign experience. Go with a consultant that’s the perfect match. Factor the cost into your final decision. Ask your top choices to submit proposals. Tip #1: Determine what services you need. You can’t start searching for a consultant without knowing what you want first. Since there are so many consultants available for you to choose from, having an idea of what services you need will help narrow down your search. What level of involvement do I want the consultant to have? A consultant can help you with your entire campaign (from start to finish! ), or they can complete a few tasks here and there. Do you lack any resources for your capital campaign? If you don’t have experience performing a feasibility study, for instance, then that should be high on your priority list. Your answers will not only help you focus on your needs but also determine if you should hire a local or remote consultant. Since both options have strengths and weaknesses, it’s important to know which choice will best suit your nonprofit’s needs. Imagine that your nonprofit is located in Cleveland, and you’re interested in hiring a consultant. Choosing an Ohio-based consulting firm means your consultant can visit your office more often, making it easier to immerse themselves in your nonprofit’s culture and create a fundraising strategy. Alternatively, a remote consultant can look at your fundraising strategy from a different perspective and can help you build important relationships outside of the city where your nonprofit is headquartered. As such, a consulting firm’s location can affect how tasks are completed and the level of communication that you’ll have with your consultant. Additionally, you need to make sure that what you want aligns with what a capital campaign consultant can do (for more information about capital campaign basics, click here). Improving your case for support. Training your leadership and board members. When you create your list of needs, it’s important to be specific. With a detailed list, you can cross off the consultants that don’t meet your needs. And it will help the person you hire understand what you want. What should you take away? Don’t start looking for a consultant without evaluating your needs first. That way, you’ll only consider consultants that can help you with the most important aspects of your campaign. Tip #2: Think about your consultant’s location. Since you’ll be working closely with your consultant on the day-to-day planning of your capital campaign, their location should play a part in your final decision. Consultants can work either locally or remotely, and both options offer different benefits for your organization. It simplifies communication. You and your consultant can meet in person to communicate about different aspects of your campaign instead of having to communicate via phone or email. When you have concerns about your consultant’s suggestions or strategy, you can express them better when you work together in person. Second, your consultant has a chance to understand your organization fully. When they come to your office, the consultant can work with your staff and learn more about your nonprofit’s culture and mission. Knowing this will help them create a plan that’s tailored to your specific needs. However, not every nonprofit will be able to find a consultant located nearby. You may have to look elsewhere to find a consultant that fits your culture or that offers the services you need. If your search for a consultant takes you farther away, it’s important to establish how you will communicate with your consultant early on so that you’re both on the same page. The consultant can take a wider, third-party view of your organization. It sometimes requires a little distance to gain a more complete perspective. Having a remote consultant not only means that they are able to see a fuller picture of your organization, but also means that they can offer fresh, outside perspectives to your capital campaign. A remote consultant might offer exactly the services you’re looking for. Depending on where your organization is located, there may not be a consultant that offers services that work for your nonprofit. It’s thus helpful to expand the search for the perfect capital campaign consultant outside of your immediate community. What should you take away? Take your organization’s needs into consideration when thinking about whether to hire a locally- or remotely-based capital campaign consultant, and understand that there are benefits and drawbacks to each location option. Tip #3: Find someone with capital campaign experience. If this is your first time launching a capital campaign (or your second, third, even fourth! ), you should hire a consultant with experience. 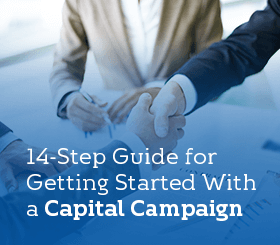 Someone with the know-how not only provides more knowledge on capital campaigns, but they also have established strategies that will increase the chances that your campaign will be successful. Since a consultant can’t guarantee success (even though they can increase your chances! ), hiring an experienced professional is one way to ensure a return on your investment. How do you know if the consultant has the skills you need? You can learn more about a consultant’s background by asking for references or samples of their work. When you get a list of references, contact them to find out more about a consultant’s past working relationships. In fact, contacting a consultant’s references is a good indicator of what it will be like to work with that professional. Plus, you can learn if their clients were pleased with the consultant’s work. Building a cohesive brand for a campaign. Creating a communication and marketing strategy. Writing and designing a case for support. Planning and performing a feasibility study. An experienced consultant should help you with every aspect of your campaign down to how you’ll follow up with donors after you’ve reached your goal. Further, a consultant should help you with the pre-planning stages of your capital campaign. During this stage, you’ll establish your goals, gain board approval, assign leadership roles, and write the first draft of your case for support. This will set the groundwork for your campaign and make the planning stages go much smoother. Before hiring a fundraising consultant, your team could even consider bringing them on during the pre-planning process to perform a capital campaign feasibility study. By doing so, your nonprofit will get a first-hand look at their approach to fundraising and get an idea of how they’d tackle your proposed campaign. Since most fundraising consulting firms offer capital campaign feasibility studies as an à la carte service, there’s no risk if your fundraising outlooks don’t compliment one another. What should you take away? When you hire someone that knows the ins and outs of capital campaigns, they can provide you with solutions that you would have never considered on your own. Tip #4: Go with a consultant that’s the perfect match. When you hire a consultant, you’ll be working with them to plan your capital campaign, which could take months (or even years!). That’s a lot of time and communication! Therefore, you should pick a consultant that you get along well with. Moreover, it’s crucial that you pick a consultant that’s a good match for your nonprofit. It’s likely that the consultant will be working with multiple people on your team, like your major gifts coordinator or prospect researcher, to bring together every aspect of your campaign. Passionate about your cause. If your consultant feels strongly about the work you do, they’ll be more invested in making your campaign successful. Open to your feedback. Of course, not every suggestion a consultant makes will be the right choice for your nonprofit. You should work with someone that takes your feedback and makes the necessary changes. Happy to work in your office. Your consultant should want to come to your office to meet and work with your staff. Remember that your relationship with a consultant doesn’t end after the campaign is over. A partnership with a capital campaign consultant can be valuable if you ever need help with your other fundraising efforts. Plus, they can assist you with your donor stewardship after the campaign. So, it’s important to pick someone you’re happy working with for a long time. What should you take away? You should pick a consultant based on more than just their skill. The consultant you hire should be passionate about your cause and easy to work with. Tip #5: Factor the cost into your final decision. When you’re searching for a consultant, you should consider how much it’s going to cost. How much a consultant charges is important because it will factor into your capital campaign budget. Consultants follow different guidelines for how they charge for their services. It’s up to you to understand what a consultant charges before you hire them. Typically, consultants will either charge an hourly rate, a flat fee, or a retainer fee (an upfront cost for large projects) depending on the scope of your project. However, the price of a consultant might include more than just their services. For example, you may be charged for the consultant’s hotel, food, and travel expenses. Level of experience: If a consultant has years of experience launching successful campaigns, they’ll likely charge more for their services. Capital campaign budget: Your budget will play a huge part in what consultant you choose. To raise the most funds, you’ll need to stick to the cost you budgeted for. Location: The location of the consulting firm may affect how much they charge. When you total the cost, make sure that you include all the fees associated with hiring a consultant. That way, you have a better idea of how much it will affect your capital campaign budget. What should you take away? There are no set guidelines when it comes to how much a consultant will charge. Be sure to get all that information ahead of time and be mindful of your capital campaign budget. Tip #6: Ask your top choices to submit proposals. Once you’ve cut your list of potential candidates to 3 or 4 consultants, it’s time to put them to the test! To get a feel for how each consultant operates, you can ask them to submit a proposal. In case you’re not familiar, a proposal is an in-person presentation or document that illustrates how a consultant will help your organization. Your nonprofit can decide which type of proposal you want to receive. Just make sure that it’s the same for every consultant (to keep things fair). Additionally, you need to pick a deadline for the proposals. Give your top choices at least three weeks to come up with solutions for your nonprofit. A shorter time frame could mean that your nonprofit receives generic solutions. Did they provide solutions for the problems you mentioned? Was the consultant addressing the concerns that you needed help with? Or did they just suggest general strategies? Was the information vague or detailed? Of course, they don’t want to give all their secrets away before you hire them, but did they provide you with some information that is helpful to your nonprofit? Did the consultant sound confident when presenting their ideas? This question only applies to in-person presentations. It’s important to hire a consultant that is confident in what they’re suggesting. Another tip to keep in mind is that everyone who is a part of the decision-making process should be available for every presentation or have access to the documents so that everyone can make an informed choice. What should you take away? Requesting a proposal is a major step in the hiring process because it gives you a preview of what it will be like working with a particular consultant. Now that you have six tips to help you find a consultant, hiring the right one shouldn’t be too difficult. Focus on what’s most important for your capital campaign and pick a consultant that can address those needs. If you want more help finding a professional, check out our list of top consultants! Capital Campaign Timeline. Running a capital campaign is a huge fundraising endeavor. Luckily, we’ve created a timeline to help you stay organized from start to finish! Feasibility Study Misconceptions. One of the first steps in planning for a capital campaign involves a feasibility study. Unfortunately, there are a lot of myths surrounding this important capital campaign component. Get the facts with this article. Prospect Research. During the quiet phase of your capital campaign, you’ll need to reach out to major gift donors to collect the majority of your goal. Use this ultimate guide to learn how to find prospective donors.